Ready for some more traintastic party tips? (See what I did there?) 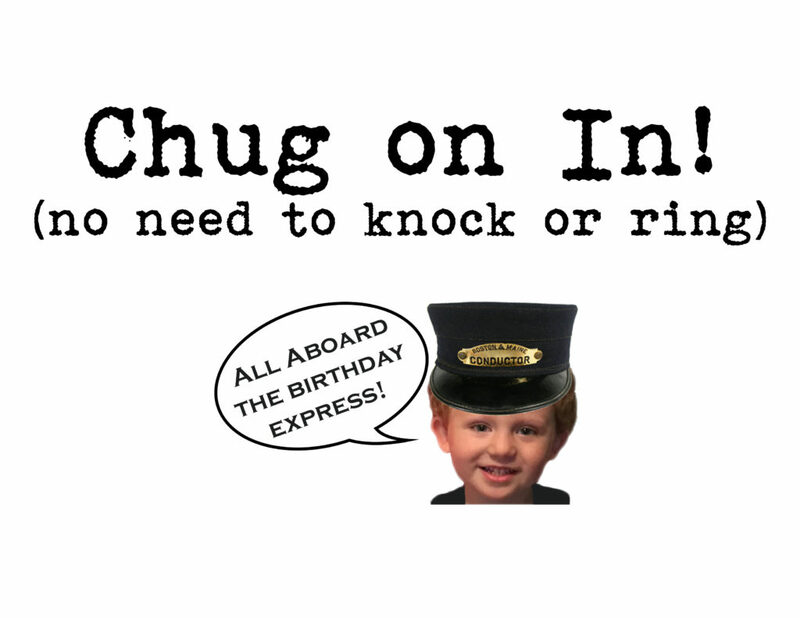 Today, I will take you behind the scenes of my train parties. Elevating a party from great to amazing is all about the details. 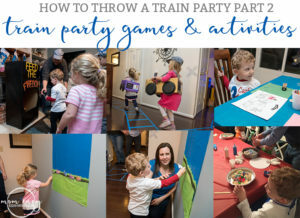 You’ll learn lots of tips from a train-party expert. First, I’ll share how I add special details throughout my decor. Next, I’ll share what’s inside of my Goody Bags. Lastly, I’ll walk you through creating my two train cakes. 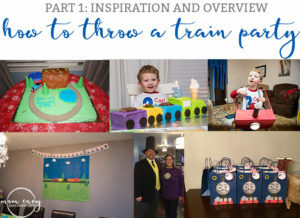 Part 4 – Thomas the Tank Engine FREE party printables! 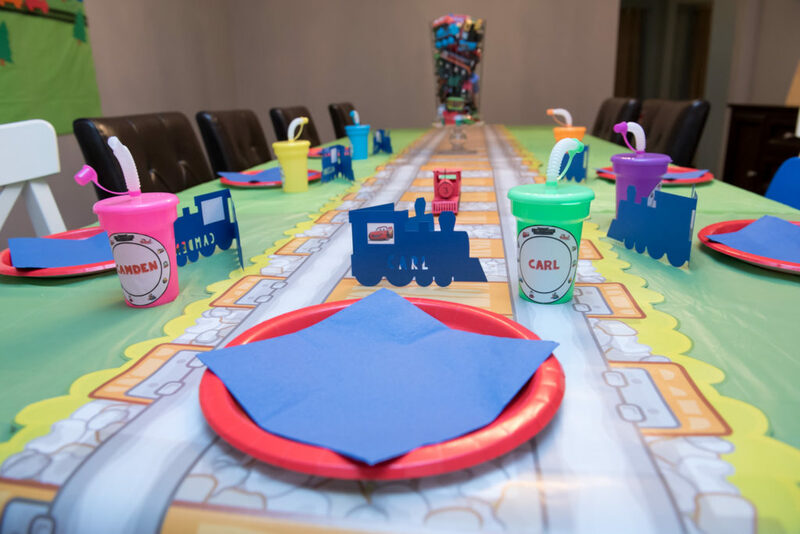 Everything paper-related you could possibly need to throw a Thomas the Tank Engine Birthday party. And it’s completely free to print! Not ready to read this list but want to save it for the future? Pin me! To be able to throw themed, detailed parties, I need to immerse myself in the subject (like Leo prepping for a movie). Before I throw any party, I do a lot of research. Yep, the nerdy school teacher in me spends hours researching anything before jumping in. And then, of course, I pull out one of my handy dandy spiral notebooks and start to make lists and notes (shocking, isn’t it? The planner-obsessed girl makes a to do list). For the circus party, I watched Dumbo and some circus youTube videos. For the winter onderland party, I didn’t have to do much research because, well, Christmas. 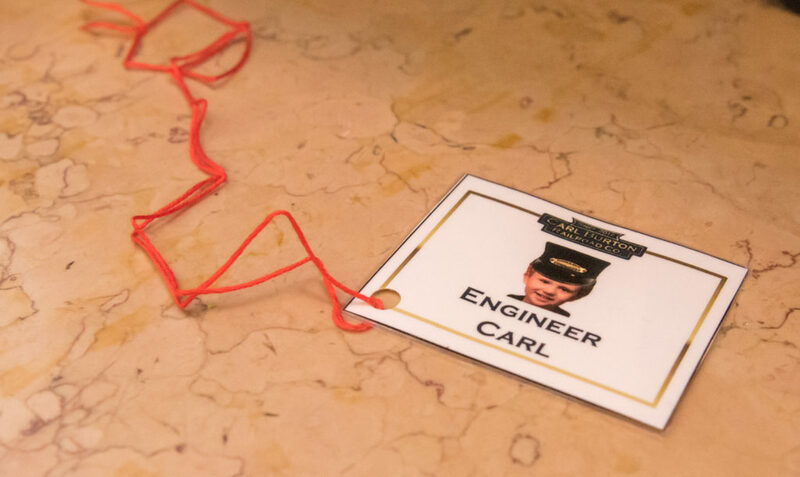 For my train parties, I just hung out with Carl for a day. But really, I did re-watch some Thomas movies and also some episodes of Chugginton. Then I took to the internet and researched the Island of Sodor as well as information about trains and how they work. Next, I headed to Pinterest. I pinned any and every train-related idea. I pinned crafts, recipes, party games, and more. Even though I didn’t use a lot of what I pinned, they all helped inspire the games and activities I selected for the party. Once I was finished my research, I edited my notes and created a party outline. One thing to keep in mind while planning, is budget. I am a money-conscious person but it can be hard with the parties to not go overboard and spend a fortune. To keep costs down, I try to do as many DIY and crafts myself rather than purchasing pre-made items. I purchase white cardstock in bulk from Amazon. Then, I use my Silhouette to Print and Cut or I cut my printables by hand. It takes a little extra time but it saves money. and also allows me to add some added detail to my parties. 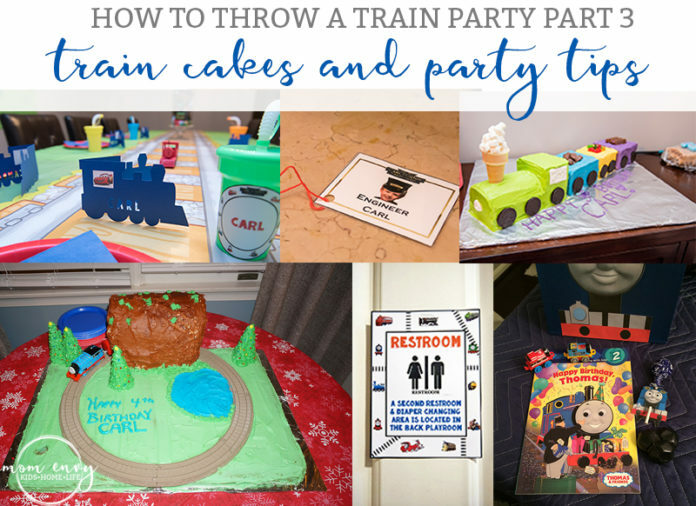 Here are some of the ways I took my train parties to the next level. 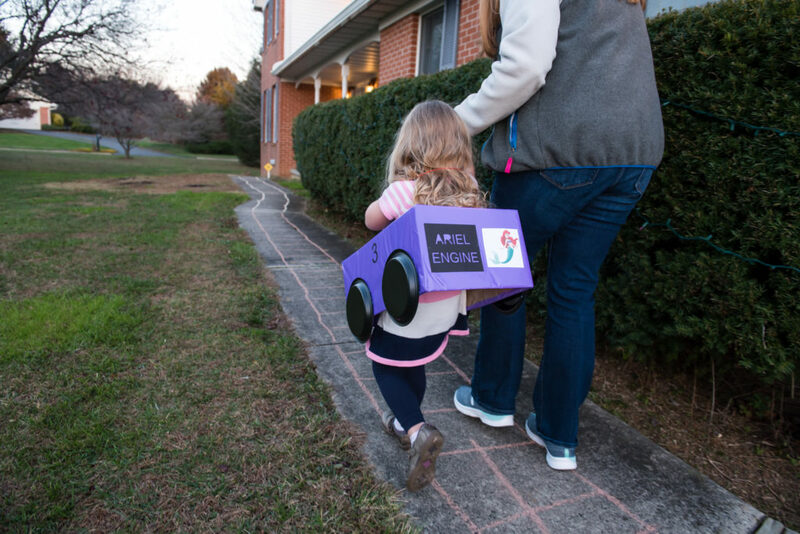 Decorated each child’s cardboard train in a color they liked as well as a character they’re interested in (such as Ariel, McQueen or Belle). 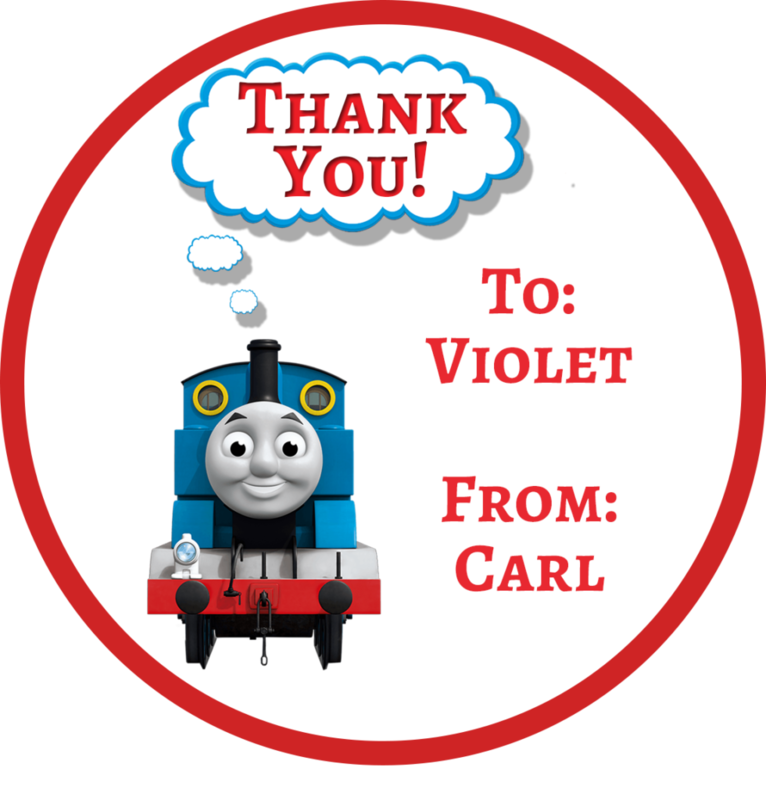 Created engineer badges for each child (which I laminated very cheaply. These go on sale a lot, especially around Christmas). Facebook is great for stealing pictures of the party guests. Made cups for each kid with their name on it. This also helps keep cups straight and serves as another favor. 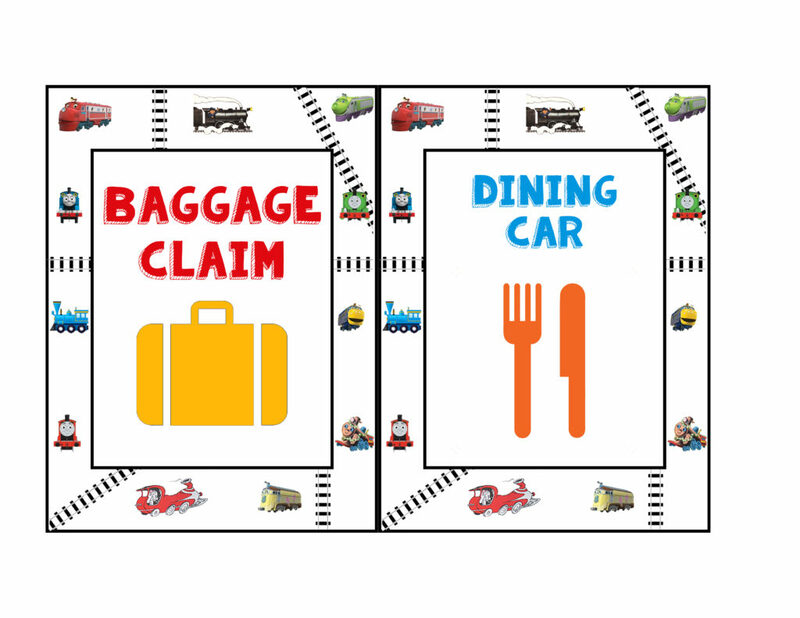 Gave each kid a train-themed place card for one of the parties (I used my Silhouette to create these but you could easily make a version in a program like Word and print and cut them). The train had a picture of their favorite character in the driver’s window as a little extra touch. Put the kid’s names and pictures wherever I can. The little train center piece even has the kid’s pictures inside of the tiny windows. 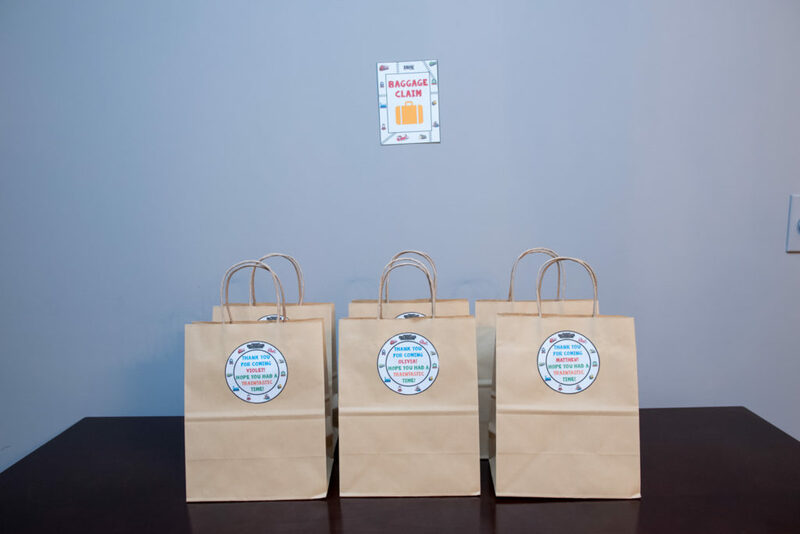 Added personal name tags to the Goody bags. 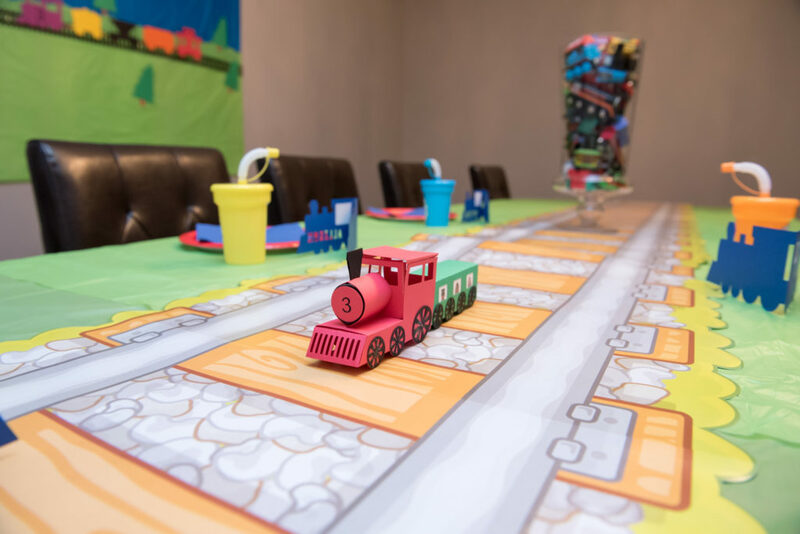 By keeping the party small, I was able to focus on making the experience wonderful for a small group of children so it wasn’t overwhelming. It also kept costs down. This can be hard but it really does create a more intimate experience. Inviting every kid in the class can become expensive quick. 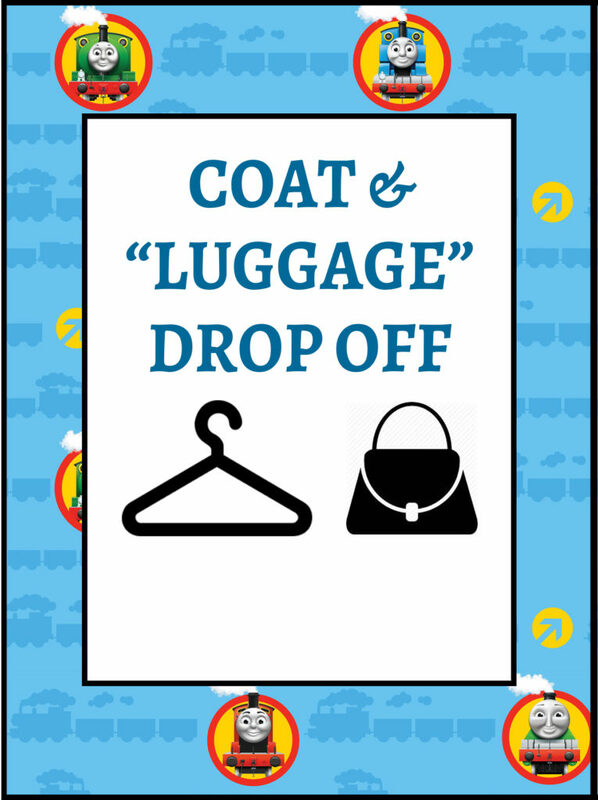 If guests aren’t used to visiting your house, it can be helpful to label things like the restroom or coat closet. It also keeps you from having to tell people where the bathroom is a hundred times. I also designed a simple sign for each party. Then, I just quickly changed out the text. 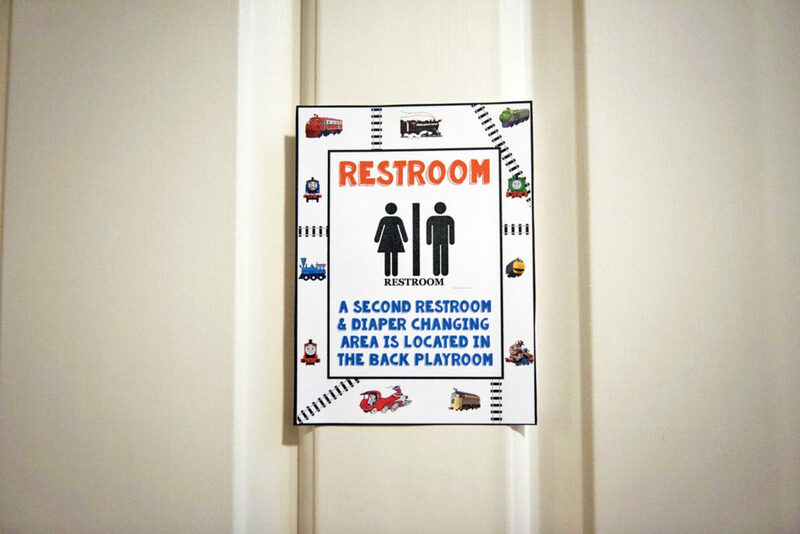 Sometimes, I put signs on things that are obvious but they add to the feel of the party. I made signs to go around the house to add a little something to the “train tracks.” I included signs like Speed Limit and Bridge Ahead. Goody Bags are either loved or hated by parents it seems. I love to make them but I don’t like to fill them with the traditional toys from party or dollar stores. Instead, I try to give something a little different. Pinterest was my best friend when it came to designing my cakes. 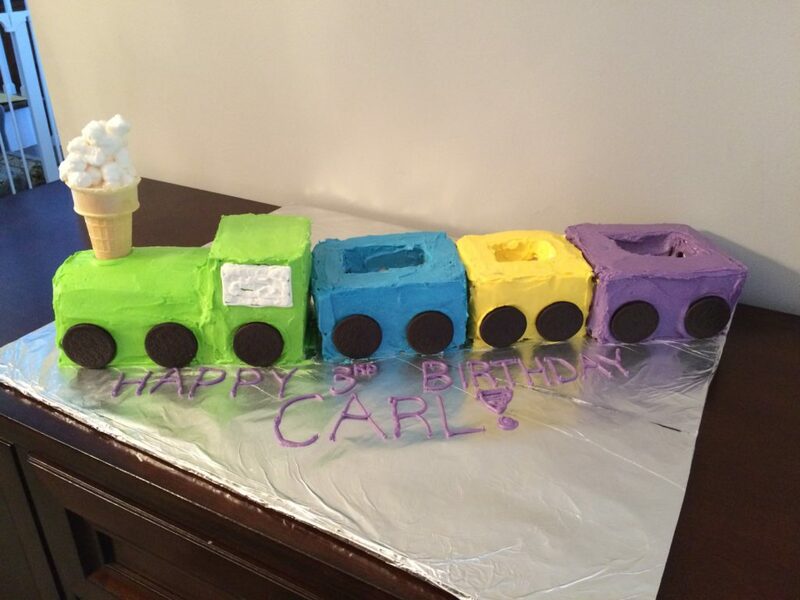 For the second train cake, Carl sat with me while I scrolled through hundreds of train cakes. He let me know what he loved and didn’t like (which was a huge help). 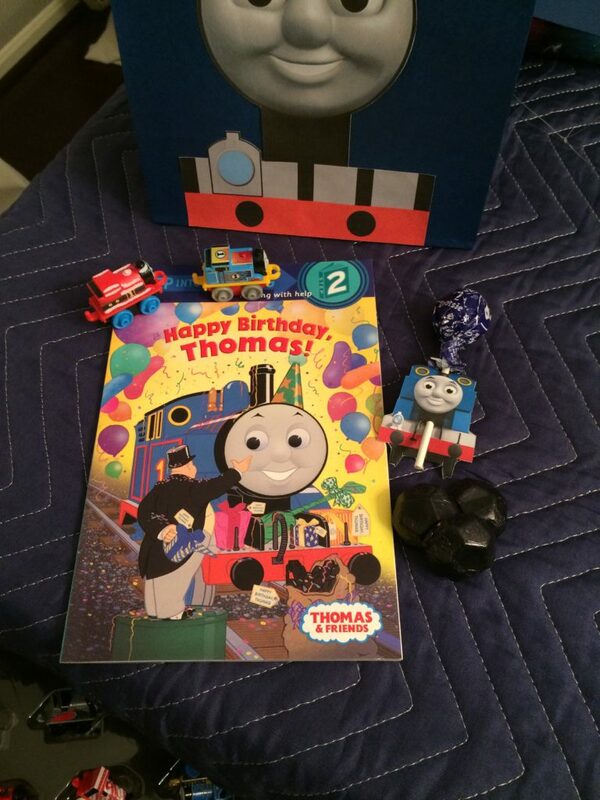 Originally, I planned to use a Thomas cake pan and make a Thomas. 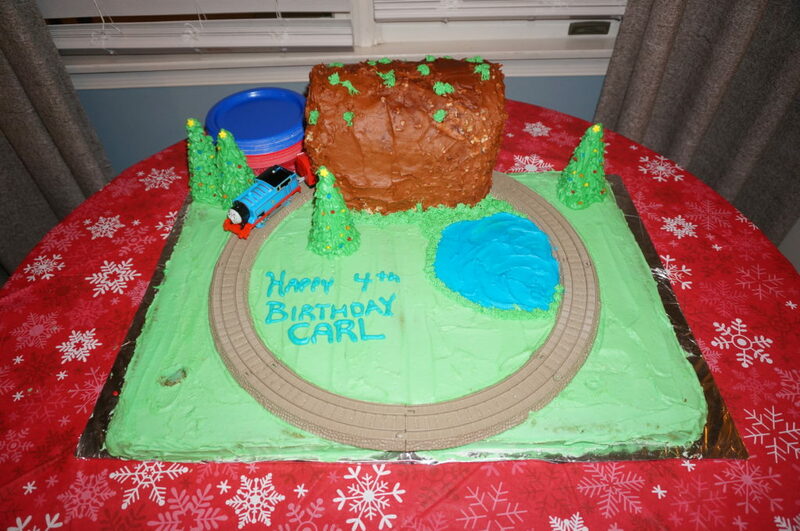 But Carl was adamant that the cake have a moving train on it. While I normally don’t let me four-year-old make decisions for me, I wanted his birthday cake to be what he wanted (not what I wanted). So I listened, and he had some great tips and ideas (although some were totally impossible, four-year-olds have quite the imagination). I loved this cake. I wish I could have made it a second time around. 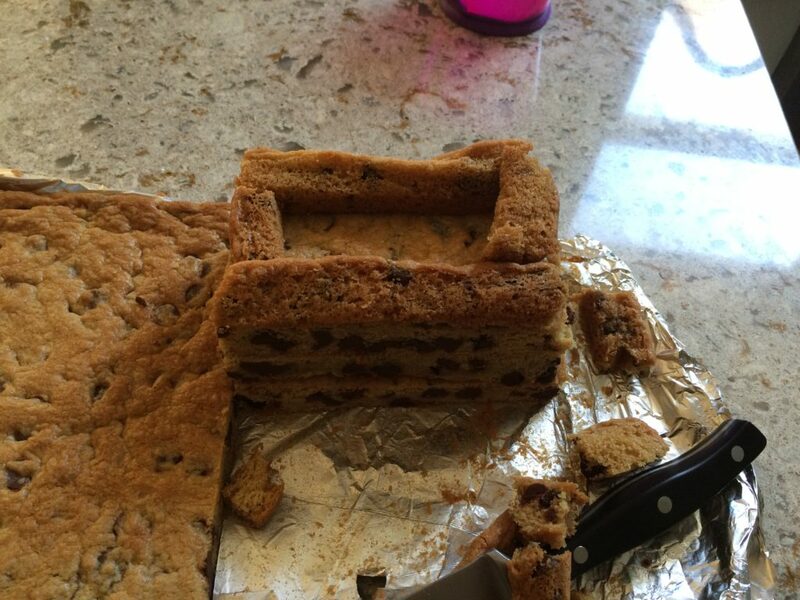 My son prefers cookie cake to regular cake (which is great because it’s easier to work with). I didn’t take step-by-step pictures at the time so it’s best to read through the directions. If you have any questions, feel free to e-mail me. 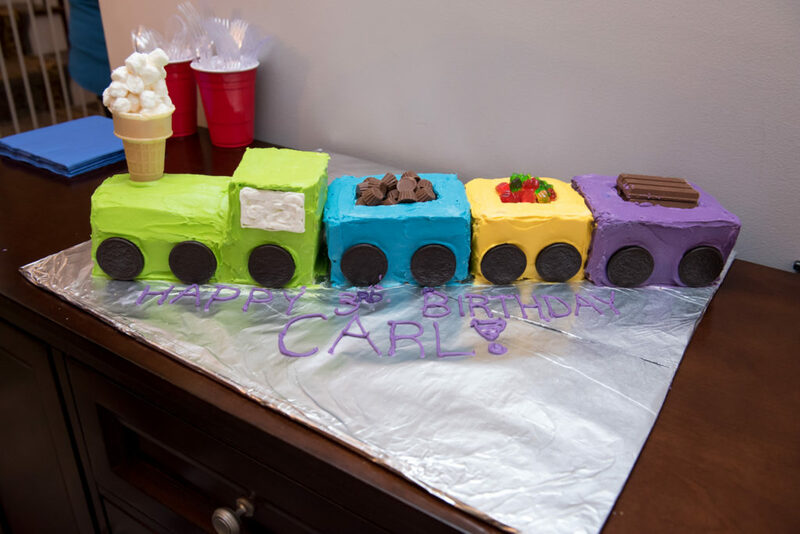 various icing colors including white or light gray(depending what color you’d like to make the train). It took about 2 batches of icing for me. Line each tray with parchment paper (I used foil and regretted it). 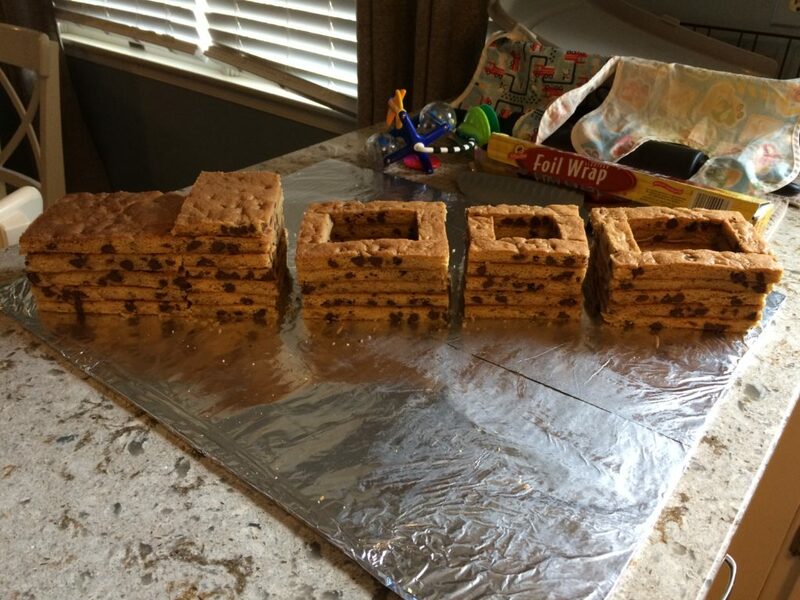 Cover each jelly roll pan with one batch of chocolate chip cookies. Spread flat. Cut out three rectangles that are 5 x 7. I used a cardboard template. Cut two long strips that are 7 inches by 1 inch. Cut two shorter strips that are 3 inch by 1 inch. Stack the three rectangles on top of each other. Then take the long pieces and place them on the edge of the top rectangle. Then place the small pieces on the edges of the shorter side (see below). Repeat this steps 4-9 one more time. Now, complete the same steps as above only use the dimensions 5 x 5 inches. 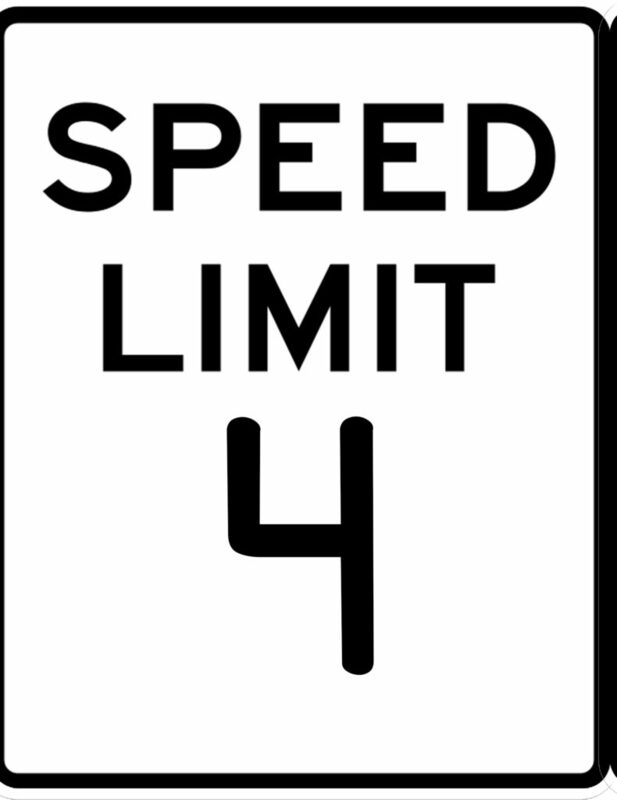 The long pieces should be 5 inches and the shorter pieces should be 3 inches. Now, cut out 5 of the 5 x 7 rectangles. Stack them. Cut out 6 of the 5 x 5 rectangles. Stack them. 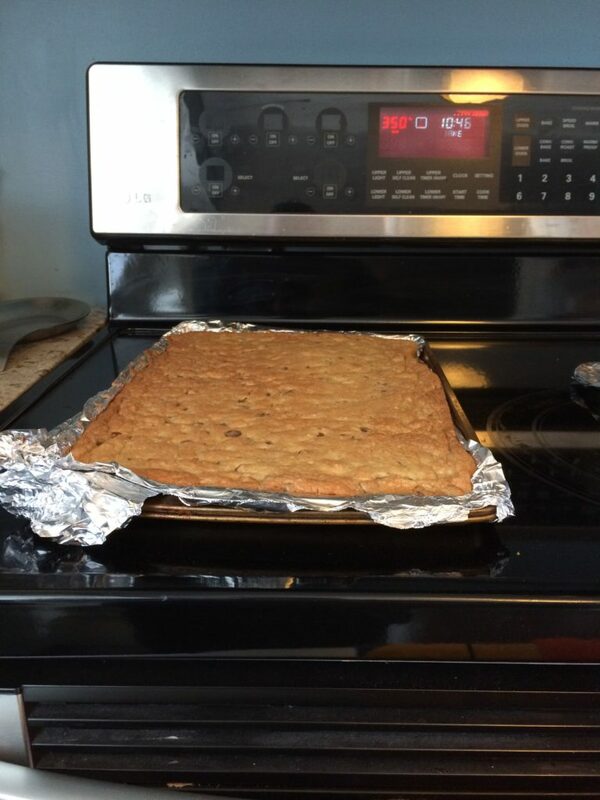 Move the cookies onto the cake/a foil covered piece of cardboard. Place one of the larger train cars at the far end. Next in the middle, place the smaller train car. Next to it, place the other larger train car. Now place the 6 stacked 5 x 5 squares. Then place the 5 stacked 5 x 7 rectangles butted directly up against the 5 x 5 squares. SEE BELOW. 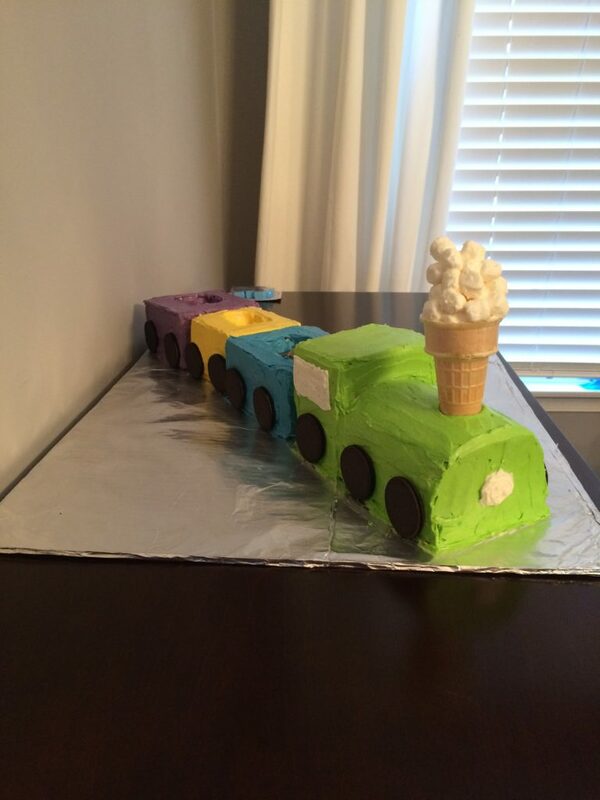 Now, cover each train color your desired frosting color. Use white frosting to create a window on the top back section of the train engine (see below). Draw a headlight on the front of the engine (see below). Place 2 Oreos at the bottom of each train car on the both of the long sides to replicate wheels (see below). 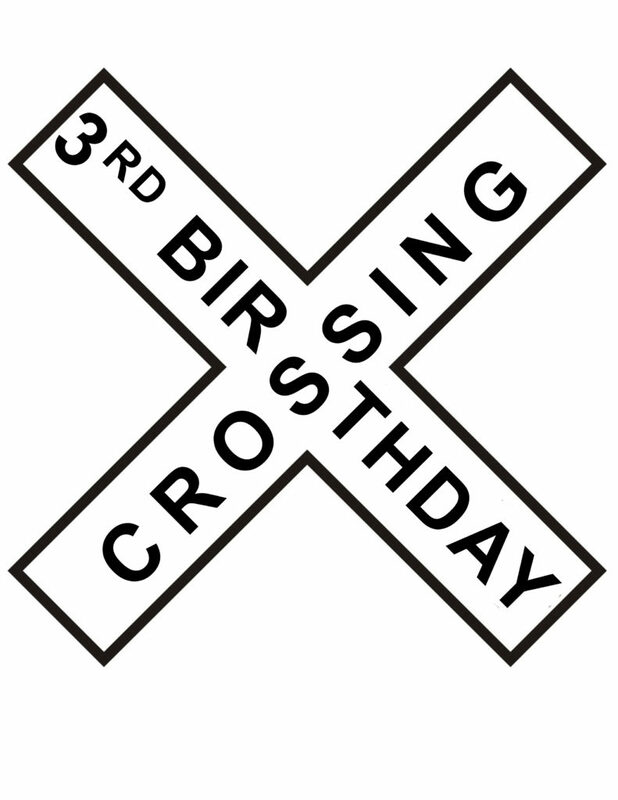 Place 3 Oreos on the front train car. Now, it’s time to make the smoke stack using a cake ice cream cone. Mix a cup of mini marshmallows with white frosting. Stuff them into the top of the cake cone. Try to round out the top a bit (it’s okay if you don’t use all of the marshmallow mixture. This is approximate). Place the smoke stack on the front top end of the engine (see below). Last, add candy to each train car. This was the harder of my two cakes to make. My son had to have a moving train on it. And since I am not Duff from Ace of Cakes, I had to use a toy train set (track masters). Line 2 jelly roll pan with parchment paper. 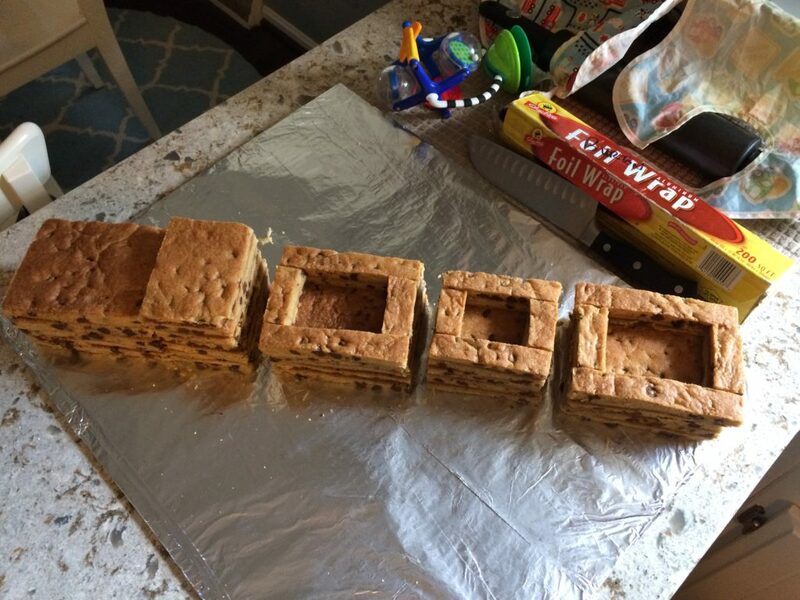 Cover the jelly roll pan with cookie dough (one batch each). Transfer to cake board/piece of cardboard (I cut a piece of cardboard and covered it in tin foil). Place the two cakes next to each other (see above). Cover the entire thing in green icing. Place the track on the cake. Add water by squeezing some frosting in a roundish lake shape somewhere on the cake. Create trees (Christmas trees for us because that’s what my kid wanted) Minus the pretzel stick. Also, I used buttercream icing. Let them get semi-dry before placing them on the cake (or just place the cone on the cake and pipe on the cake so you don’t need to move them). Cover the cardboard tunnel with rice krispie treats. Allow time to set (I left mine out for about 8 hours to set). Place the tunnel on the cake. Cover the tunnel in brown frosting. Add some little green sprouts on the tunnel (like moss). 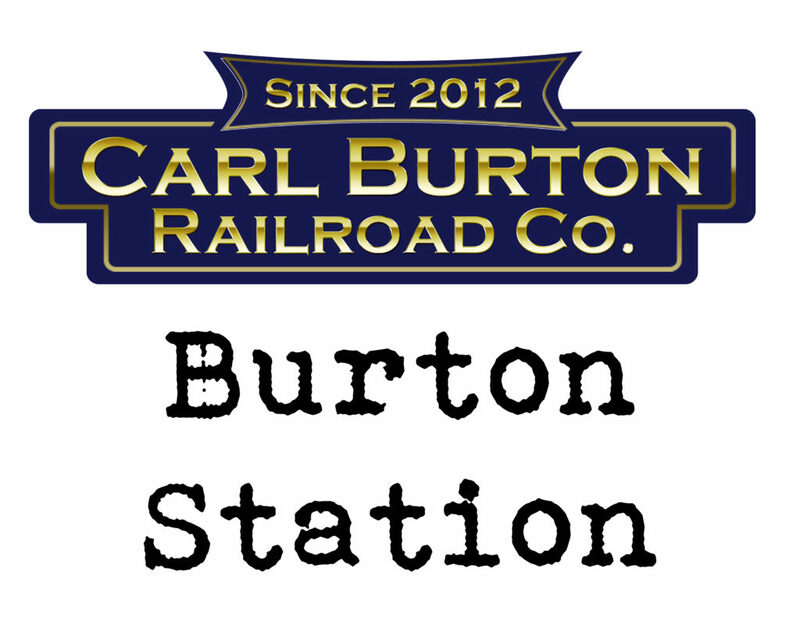 Looking for more train party information? Check out Part 1 and Part 2!